Spencer has Ohdo Syndrome. More specifically, Spencer has the Say Barber Biesecker Young Simpson type of Ohdo Syndrome along with Genitopatellar Syndrome. When we had Spencer, our lives turned upside down. Before he was born, I had visions of him playing soccer and T-ball. He would geek out over Transformers and Star Wars with his dad. He was going to have lots of friends and be popular at school. He was going to be the perfect child. Here’s how things turned out. Ohdo Syndrome is incredibly rare. There are probably around 100 known cases in the world. Before Spencer, none of our top-notch medical team had heard of it. Ohdo Syndrome is a de novo genetic syndrome, meaning it was not inherited from his dad and me, and is caused by a series of additions and deletions on gene KAT6B, chromosome 10q22.2. Basically, Ohdo Syndrome causes heart defects, blepharophimosis and ptosis (eye droop), hypothyroidism, intellectual delay, speech delay, feeding problems, hypotonia, hearing loss, muscle contractures, and it has very distinct facial features. 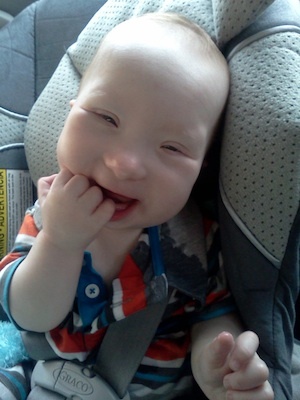 Some kids, like Spencer, have a cleft palate, airway malformations, and small jaws. Kids with Ohdo also have very large thumbs and big toes, which are the more amusing features. Ohdo Syndrome has caused Spencer to have intellectual and physical delays, hearing loss, heart disease, malformation of his airway, cleft palate, small jaw, ptosis, hypothyroidism, hypotonia and hypertonia, and limited use of his hands. He has sensory integration disorder, is non-verbal, and cannot walk. He is an awesome crawler and loves his wheelchair. 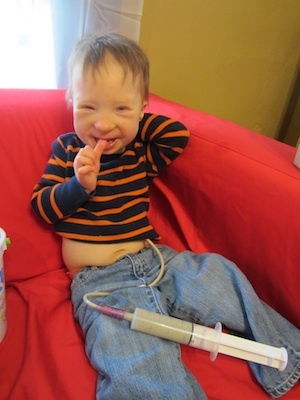 He has a feeding tube that he was completely dependent on until about six months ago. He has made great process with his eating, but still has a hard time chewing, which is common in kids with Ohdo Syndrome. His complex airway made him dependent on supplemental oxygen constantly until six months and at night until a year old. Spencer also has the mutation for Genitopatellar Syndrome, which is on the same part of the gene. Keep in mind, not all kids with Ohdo Syndrome have Genitopatellar Syndrome, although there is some debate whether it is a separate syndrome or not. Anyhow, because he falls on the Genitopatellar end of the spectrum, he also has a clubbed foot, neurogenic bladder, and nerve damage from a tethered spinal cord. Spencer has had over two dozen surgical procedures, and has a few more that will need to be performed in the future. Ohdo Syndrome has wreaked havoc on his little body, and he has had to have a lot of repair work done. He had to wear tubes in his tear ducts for over a year due to the crazy face anatomy Ohdo Syndrome dealt him. He had an eyelid lift that will require revisions as he gets older. He had his cleft palate repaired and adenoids removed. He’s had several urological surgeries and needs at least a couple more. He had spine surgery. He will have heart surgery next year. He’ll probably need some more leg surgery as he gets older. He has scars. We didn’t know any of Spencer’s medical issues, aside from his clubbed foot, before he was born. He was a day old when the pediatrician took one look at him and sent him to a large, regional children’s hospital. He spent 83 days in the NICU, was looked at by dozens of doctors, but yet none of the doctors had any idea what was going on with him. They knew it was something genetic due to his unusual facial appearance and other anomalies, called dysmorphic markers. He passed all his genetic tests and had the genetics team baffled. Spencer was around six months old when our geneticist started to finally sort out Spencer’s diagnosis. His facial features were starting to become very distinct and the doctor had seen them once before. Spencer was two and a half when the gene for Ohdo Syndrome was discovered and children with it could be diagnosed. Our geneticist pulled some strings and was able to get Spencer tested before the tests were clinically available. He was diagnosed with Say Barber Biesecker Young Simpson type Ohdo Syndrome on April 4, 2012. Life with a kid like Spencer has been interesting. Life with Spencer is our normal and I can’t imagine what our lives would be like if Spencer had been born typical. It has been an incredible journey and I have met many amazing people along the way. Yeah, we replaced soccer practice with physical therapy, and T-ball with occupational therapy. He still geeks out over Transformers with his dad and sleeps with a light saber in his bed at night. He has tons of friends and is the most popular kid in his class. Most of all, Spencer is perfect. Ohdo Syndrome causes very distinct facial features, so a lot of kids with Ohdo Syndrome look alike. Spencer has “twins” all over the world! Our kids have giant thumbs that are great for sucking on. Ohdo Syndrome causes grow retardation. Spencer is wearing his winter clothes from last year this year. They are cheap on clothes. Parents of kids with Ohdo Syndrome have an increased medical vernacular, which is great for intimidating people. Ohdo Syndrome is so rare that when you meet someone new on Facebook who has a loved one with it you get excited. We have friends from all over the world! Kids with Ohdo Syndrome have speech delays. While it can be frustrating, having a non-verbal kid has it perks. It’s pretty quiet around our house. Every inchstone our kids achieve is a reason to celebrate! I don’t have to worry about Spencer marrying the wrong girl. He is already betrothed to Caoimhe, a girl with Ohdo Syndrome who lives across the ocean from us. Her mother and I have decided they are going to get married and give us cute little Ohdo Syndrome grandbabies. Our kids are incredibly special and unique. There aren’t words to describe how quirky and beautiful Spencer is. There is something amazingly special and collectively unique about our kids that all of us parents of kids with Ohdo Syndrome see and it’s the most brilliant thing. Our kids have Ohdo Syndrome, not Ohio, Ohdi, or Otto Syndrome (common errors). Ohdo Syndrome does not have them. Our kids rock their gene mutations. Rachel Nichols is Spencer’s minion. She lives in Ashland, Kentucky with her husband Jimmy, son Spencer, and daughter Quinn. You can follow their journey, Joining the Club Foot Club.